Clients are becoming rather adventurous in their choice of colour for both the interior and exterior of their conservatory. Perhaps this is a reflection of the changing trends in decoration and realisation that colour doesn't have to be permanent. To help clients decide what colour to paint their conservatory, orangery or rooflight, and also to make sure our buildings leave the factory with a paint that will perform well over the years and in all weather conditions, we have worked closely with a leading paint manufacturer to produce a range of colours in high performance paints developed for the professional user. 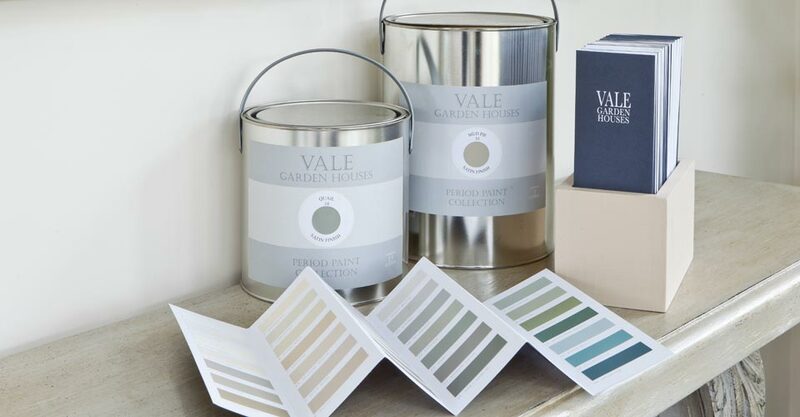 Our Period Paint Collection has been designed with the conservatory in mind and is available in forty two beautiful colours. The colour range consists of subtle whites and creams through to more earthy and natural browns, greys and greens. The range is designed to provide contrasting tones and colours that all work in harmony with the outdoors, adding a depth and richness to your scheme. With the colours also being available in a high performance matt Emulsion, the paint is versatile enough to be used throughout your home. Our conservatory paints can also be used on Pinoleum blinds and a variety of products from our Interiors Collection which will help you to colour co-ordinate your room and give balance to this elegant space. This is a high quality, oil based, durable satin finish wood paint. It is recommended for use in conjunction with our oil based, wood primer/undercoat which is available in either white or grey. The paint is microporous which allows the wood to breathe, has excellent water shedding properties and a high resistance to flaking and peeling. It is intended for application onto softwood and hardwood timber surfaces including conservatories, windows, doors and furniture. It can also be applied over other oil based systems and onto well prepared metal surfaces. It is a very easy paint to apply and has a gloss like finish when applied that dulls to a semi-gloss within a few weeks. 1 litre covering approximately 16m². It is available in 2.5 and 5 litre tins. This is an extremely durable water-based matt emulsion which is excellent for both interior and exterior use. The paint is hardwearing and scrub-resistant. Two coats may be required to build up film thickness to achieve an even coating and expected performance. It can be used on old and new plaster, masonry, cement-rendered walls, brick, timber, hardboard and many other surfaces. 1 litre covering approximately 10-15m². It is available in 2.5 and 5 litre tins.